Part of what I do on a day-to-day basis is educate business people who are interested in learning more about cloud computing. One executive asked me a great question last week that I wanted to share with the community. It was a great request, because too often I think we’re focusing on the wrong questions about cloud computing. 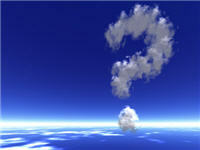 Today most of the questions around the cloud center on security, reliability and performance. Those are important questions – things that every enterprise needs to be completely satisfied with to make the move to the cloud — but those conversations need to happen in the context of what the business can do with the cloud.